“Then did they spit in his face, and buffeted him; and others smote him with the palms of their hands . . .” (Matthew 26: 67). Jesus’ face is masked by one of the soldiers, who taunts him ‘Tell us who it was who hit you.’ But his body language speaks of dignity and resignation to God’s will. Caiaphas, wearing a mitre and holding a crozier, both symbols of religious authority, sternly surveys the scene. The green arcade behind the figures echoes the lively actions of the soldiers. 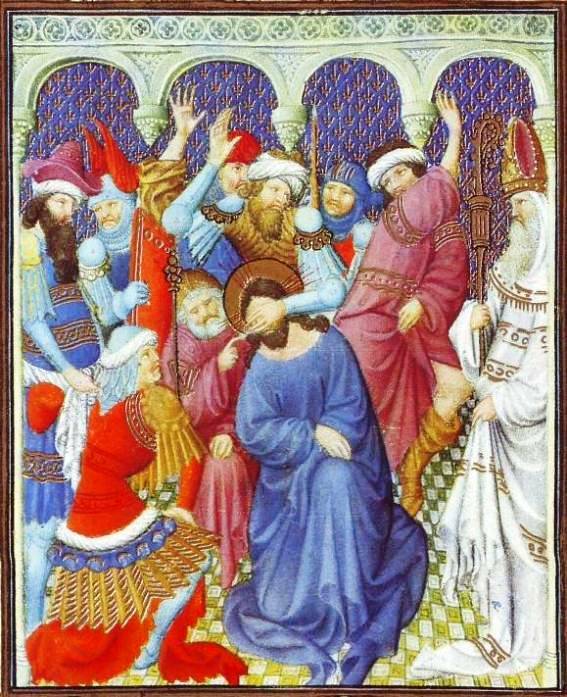 The colors are interesting and distinctive: orange-red, pink, plum, golden brown, and a blue of different quality than we have seen in other paintings in the Book of Hours. The clothes of Jesus’ tormenters are sumptuous, but the faces are not flattering: pug noses, ﬂat features, and scowling mouths. Clearly the artist was sending a message about these people and their cruelty.